Master Plastics supply a range of GRP door canopies which can be a superb solution to add value to any home by improving its appearance. Easy to install and maintain, a door canopy is a cost effective and simple way to transform and enhance the entrance to any home. We are able to produce a wide range of door canopy designs which suit any property, regardless of its age or style. Also offering protection from the elements, over door canopies are functional as well as visually appealing. The main use of an over door canopy is to improve the aesthetics of a building, and this simple installation can increase the value of any home by adding 'kerb appeal' to the property. They can be used as a front door canopy or a porch canopy. Stafford Door Canopy Description: Flat top white canopy with smooth under tray. Standard widt..
Warwick Door Canopy Description: A flat topped lead look canopy with smooth white fascia incorpo.. Description A flat topped lead look canopy with scalloped edge feature over a smooth white fascia..
Castledene Door Canopy Description: Flat white topped canopy with a smooth white fascia and a ..
Sherbourne Door Canopy A realistic traditional door canopy with rolled-lead effect top over a sm.. The Suffolk Over Door Canopy​ A traditional tile effect hip-roof canopy with light texture fasci.. The Elsdon Over Door Canopy​ Available with terracotta or grey tiles in brown or white. Simp.. 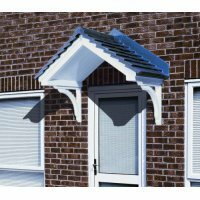 The Ikley Over Door Canopy​ Available in white or brown with grey lead effect top Realistic l.. The Cheltenham Over Door Canopy​ A dual pitch, tile effect canopy with imitation woodgrain detai.. The Carisbrooke Over Door Canopy​ A Dual pitch, tile effect canopy in a choice of terracotta or .. The Rockingham Over Door Canopy​ Elegant Victorian style door canopy in a smooth finish incorpor.. The Berkley Over Door Canopy​ A mono-pitch clay tile effect roof with woodgrain effect base. A .. The Tamworth Over Door Canopy​ A quick to install, effective covered canopy. The realistic clay-..
A gloss finish bracket with ogee detailing along the edges, and a recessed centre line. A smooth ..
A decorative wood-effect bracket for use in many applications. This simulated woodgrain bracket is ..
A decorative wood-effect bracket for use with our door canopies, & other applications. A woodgrain ..
A gloss finish decorative corbel bracket measuring 470 x 140mm. This decorative bracket is supplied.. Gloss finish decorative corbel bracket measuring 310 x 100mm. Designed to suit many applications th..
A decorative bracket cover measuring 310 x 160mm. Manufactured in smooth finish, rigid GRP. Designe.. This decorative Gallows bracket is one of our most popular sellers. Measuring 330 x 225mm. Quick & ..
Large gloss finish decorative bracket measuring 605 x 405mm. These brackets may be used as decorati..